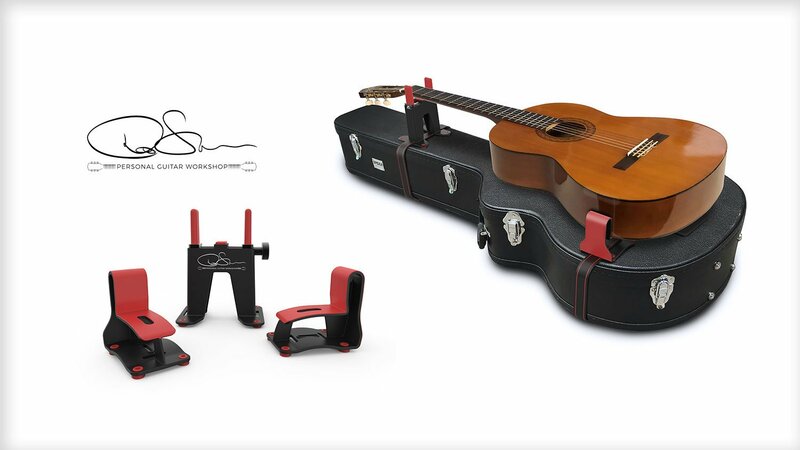 An all-new portable guitar stringer and maintenance device, the Gig Portable Guitar Workshop, designed by IPS, will be showcased at the National Academy of Music Merchants (NAMM) Show in Anaheim next week (Jan. 24-27). With Joseph Toro leading the industrial design and product development efforts for IPS, the Gig makes it easy to maintain and repair guitars while on the road. It is the first portable Personal Guitar Workshop that straps to a guitar case, to firmly hold a guitar for easy maintenance. The non-reactive rubber touch points gently grip the guitar, and the adjustable tower clamp makes it possible to hold the guitar on its front or side. The Gig solves the problem of not having a proper place to string and maintain any stringed instrument (acoustic or electric guitar, ukulele, etc.). When not in use, the Gig can be packed away neatly and conveniently. As an alternative to strapping to a guitar case, the non-slip feet allow the Gig to be used on a flat or event surface, such as a table. “We selected the engineering team at IPS to help design the Gig because of their high levels of expertise, and that resulted in construction, aesthetics and soundness that hit all the right notes,” said Rhonda Sommerfield, president of David Sommerfield, LLC. The Gig will also be manufactured by the IPS/Forward team.